As the Whorl Spins: Would You Like Some Cheese? Well, that was a waste of a perfectly good two weeks. If you thought there was some whine in the last post, you ain't seen nothin'yet, as the man said. 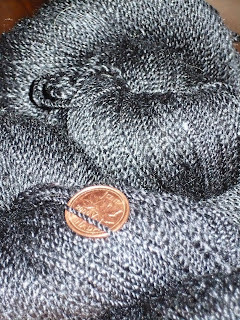 I got my SSZ black silk/merino plied. Just over 500 yards, 15 WPI, and 6 TPI. 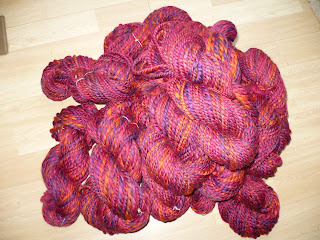 It will eventually be the warp for a rigid heddle project, but I have to make the same yarn spun the traditional ZZS first. At least, that's the plan. 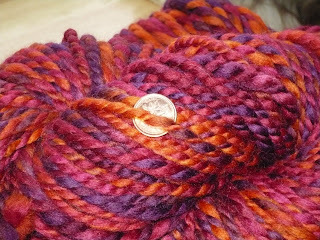 I love the colors and there is a sheen to the yarn that is absolutely fabulous! Steve came home about 2 weeks ago with a little sniffle himself. Which turned into a monster headcold overnight. And for 2 days he laid on the couch sneezing and coughing. I soldiered bravely on, making soup and making sure there was plenty of Kleenex in the house. Then, a little tickle began at the back of my throat. I started to sneeze. Hard. My eyes got red and watery. And the headache set in. Being the stoic type, I marched ever onward. There was laundry and spinning and correspondence to see to. So for three days, I tried to pretend nothing was wrong, all the while munching cold and sinus pills, echinacea, and vitamin C tabs. On day four, I gave up the fight. I didn't even try to get out of bed. I surrendered to The Worst Cold in the History of Humanity. There are not words to describe my misery. I had what we suspect was the dreaded H1N1 in November and was livelier than this. For four days, I barely opened my eyes. I had the most amazing sinus headache--my migraines are so much more pleasant than this headache was. I had goo built up in the passages in my ear, so the room spun uncontrollably at times. I lost my voice to post-nasal drip irritation. I couldn't inhale. It was gruesome. No fever. No chest symptoms. Just a head cold. And ten days later, I am still struggling to recover. You see, sometimes, when the weather turns really, really cold, the sewer gas exhaust pipe on our roof gets blocked by ice. This requires us to get the maintenance crew to come and unblock the pipe, which sometimes takes several days to happen. And while that pipe is blocked, we invariably get not only the delightful aroma of sewer gas drifting through the upper floor of our house, but an airlock that prevents the upstairs toilet from flushing properly and slows the bathtub's drainage to a trickle. This happened just as we were about to go away for a few days after Christmas. So, we left it. We figured the weather would change or we would get someone to fix it once we got back in the new year. This turns out to have been a bad plan. We came home to a partially-flushing toilet and a slow-draining bathtub and a forecast of above-zero temperatures. That meant we didn't have to call the maintenance creww, which, in the past, has turned out to be a great big hassle most of the time, anyway. So we didn't. And then the toilet stopped flushing. It just filled up with water and overflowed. The bathtub ceased to drain. At all. There was much mad plungering and bailing, all in vain. It was the weekend. There was no maintenance crew to call. Steve was sick, and I was beginning to feel a wee bit punky myself. Then Julia went into the downstairs bathroom, which is directly below the upstairs bathroom. When she came out, she asked why the ceiling was bubbling in the bathroom. A brief inspection, followed by a ginger poke at the bubbled paint on the ceiling, resulting in a sudden downpour of sewage into the downstairs bathroom. Buckets were grabbed and every available container was pressed into service. I stood, valiantly, under the downpour, catching the mess in what ever container came to hand while Steve cursed above my head, trying to bail the upstairs toilet and stem the flow of water. Every towel in the house was put to use. There were tears and curses and all manner of drama. Then we went to bed. The next morning, the maintenance crew was called and they mosied on around that evening, climbed the ladder, rattled a hook the exhaust pipe and asked us to check the toilet. This resulted in another deluge in the downstairs bathroom. Mr. Maintenance diagnosed the problem as the ice jam being too far down the pipe for them to reach and promised he would be back in the morning with some brine to pour down the pipe and fix things once and for all. Steve decided he would try snaking the drain line to see if there was a problem there, too. The promised brine showed up late the next day, and when I checked the flush this time, there was a mighty bubble and a rush of sewer stink, and a slow, gurggly drain. Huzzah! And I sent the maintenance crew on their merry way. I was so excited that I ran upstairs to flush the toilet again, and that's when the real trouble began. Not only did it rain in the downstairs bathroom again, but water started to come out around the base of the upstairs toilet. The wax seal under the toilet had given. It was too late to do anything but sulk that night, and both Steve and I were well into our nasty colds by this point, so we decided we would get a new seal and lift the toilet the next evening and repair it. That was when I decided to stop getting out of bed for a few days. But I'm up and around now, and while I am not 100%--there is still some congestion that makes my inner ears suddenly malfunction and dizziness ensues, and a mild lingering sinus headache on the left side--I'm trying to catch up. So many wonderful opportunities have come my way this last few weeks, and I couldn't say no. But I did have to say "later". And now later is here. 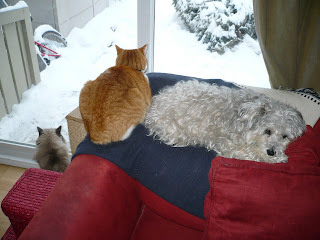 You just know Teagan the Wonder Schnoodle is thinking, "Oh, the crap I have to put up with around here..."